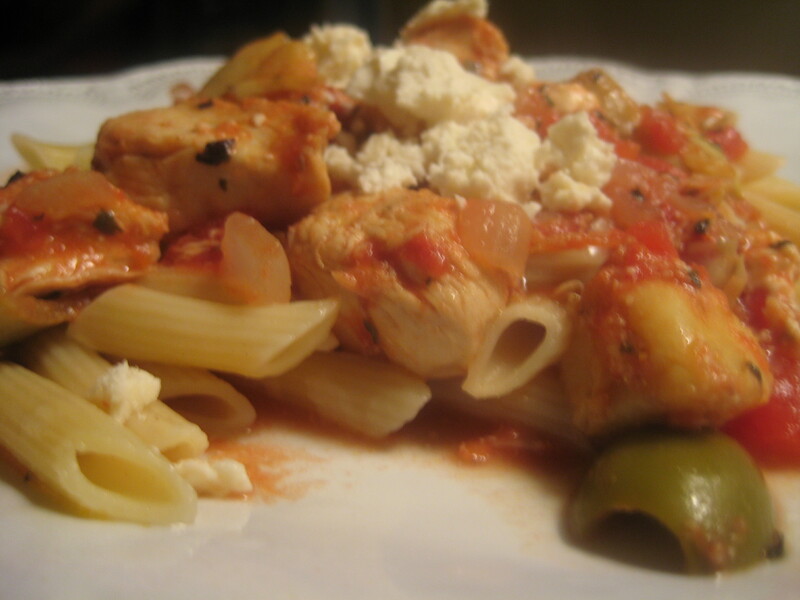 We love anything with Greek flavors and have tried several variations of Greek pasta. Usually we find that something seems to be lacking but I think we’ve finally found one to stick with. This was delicious and came together really quickly. The flavor was great and you can definitely play around with the ingredients and try different substitutions. For example, I forgot to buy kalamata olives at the store and we had green in the fridge. Rather than omit olives, I decided to throw the green in and it worked great. Bring a pot of water to a boil. Follow cooking instructions on box for pasta. Heat a large skillet over medium to medium-high heat (depending on your oven). Add olive oil and heat until shimmery. Add chicken strips and cook until they start to brown, about 5 minutes. Add diced onion and garlic and saute for about 3 more minutes, until onion begins to look translucsent. Add in artichoke hearts, olives, diced tomatoes, basil and oregano. Season with salt and pepper, to taste. Reduce heat and cook on low until heated through. Stir in 1/4 of feta cheese and remove from heat. Place cooked pasta in a large bowl. Pour chicken mixture over pasta. Top plated dishes with remaining feta cheese.